In 1973 my high school band went on a European tour. I remember seeing a full functional calculator in Geneva, Switzerland, for the equivalent of $48 and we thought that was cheap. There used to be a small hand-held device that was really an advanced abacus. It could add and subtract only. It was maybe 1/8" thick by 3" x 5", and you operated it by sliding panels back and forth with a stylus. The computing mainstay was the slide rule, but it wasn't exact with any calculation involving large numbers. Our office bought an early electronic desktop calculator, that added, subtracted, multiplied, divided and did square roots. It was made by Sharp and they paid $700 for it. Everyone was impressed. I'm guessing this was around 1968. 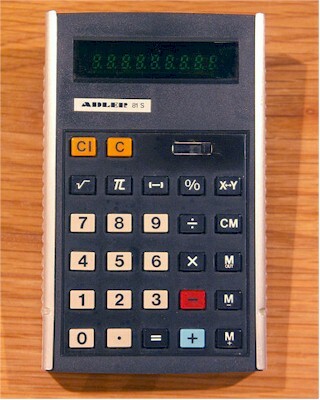 I bought a pocket calculator from Sears back in 1974 or 1975 with just bare-bones functions and I paid $40.00 for it. Thankfully, as the years passed the calculators got better and cheaper.